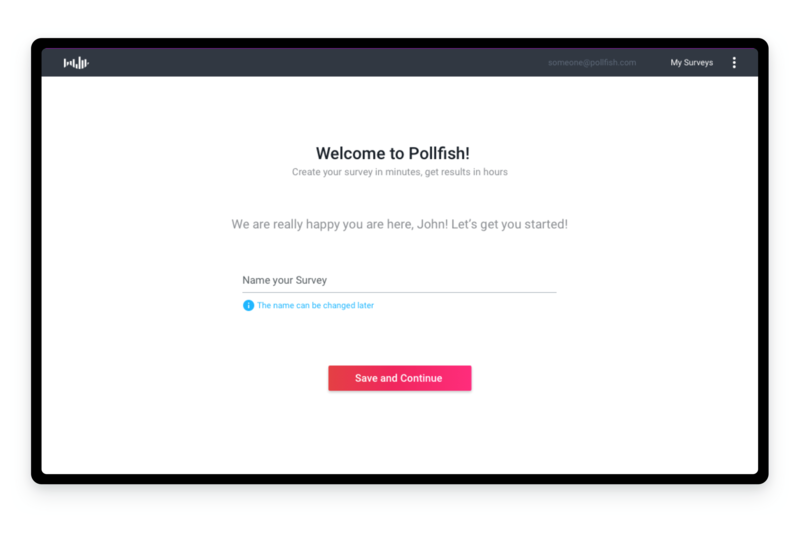 Pollfish is a survey platform which gives researchers the ability to create surveys and collect results online through mobile apps and the web. 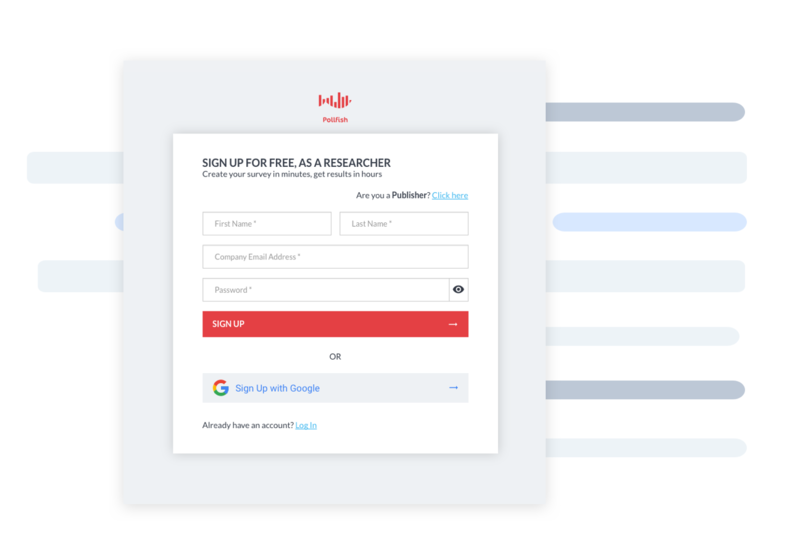 The two main personas of the platform are the Researcher - someone who wants to create a survey and the Publisher - someone who wants to utilize monetization through their app or website. 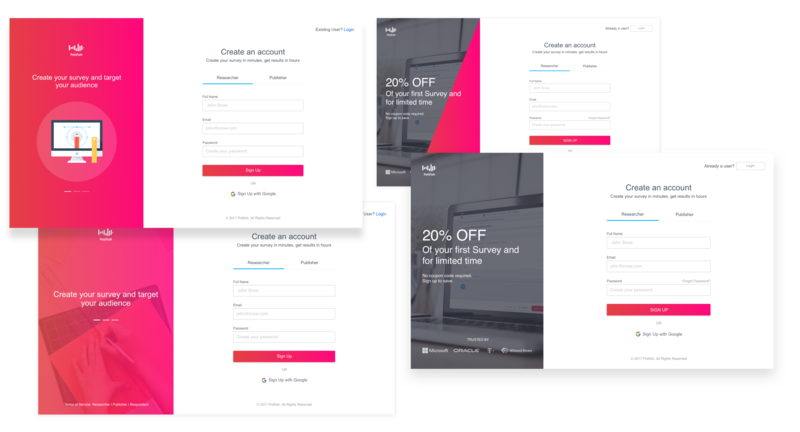 Focusing on the Researcher funnel, our numbers showed that 79% of the customers who landed on the sign-up page continued to the product and from those who continued (new-sign ups) only 22% completed the journey to check out (buy the survey). As the sole Product Designer of Pollfish, I led the initiative for designing the on-boarding experience for the platform for the Researcher persona. I conducted user interviews, mapped out user journeys and designed small progressive quick wins so that we could iteratively enhance the on-boarding experience. I worked alongside a Product Manager, a Sales Manager and a Customer Support Manager. The design solutions were launched globally in February 2017. What I observed was that for our Researcher persona - one of the 2 core verticals of the platform - the drop off rate was massive even at their very beginning of their journey in using Pollfish. What was also alarming was the revenue generated by first time users. I partnered with the Customer Support Manager to get insights from support tickets and find opportunities to invest in on-boarding based on current pain points. In addition, I partnered with the Product Manager to craft a survey and get direct feedback from bounced customers. We focused both on the sign-up page and on the rest of the journey. I partnered with the Sales Manager to get a better understanding of how they approach potential customers. I participated in 3 personalized demos in order to pick up details on the type of language and keywords the customers use in order to explain the product and also get an understanding on what customers are looking for when searching for platforms like Pollfish. 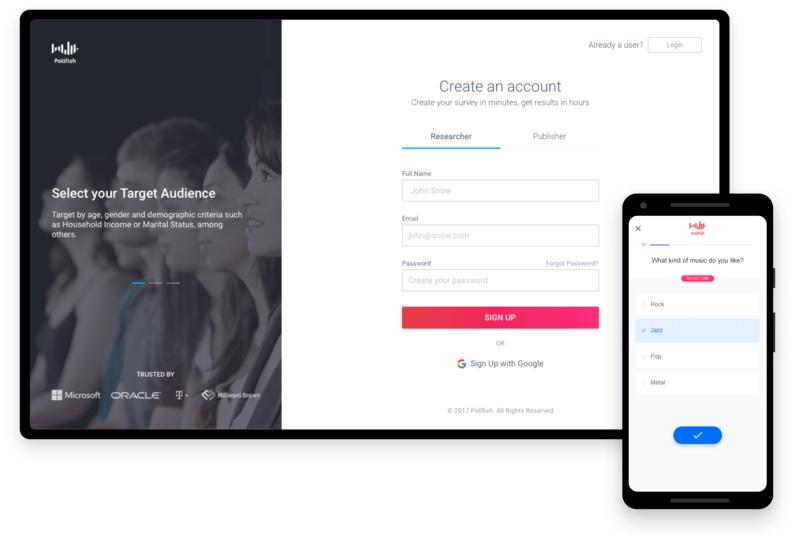 Customers would sign up in order to play around and discover whether they could target audiences by age, gender and other demographic criteria. They were very interested in the different question types that we offered as well as the Screening Question logic that we use. I partnered with the Product Manager and the Customer Support Manager to formulate hypotheses, based on our findings, on how might we optimize the journey with small progressive quick wins. By redesigning the sign up page and communicating our value proposition better, then we will reduce the number of customers bouncing from that page and create a sense of trust. 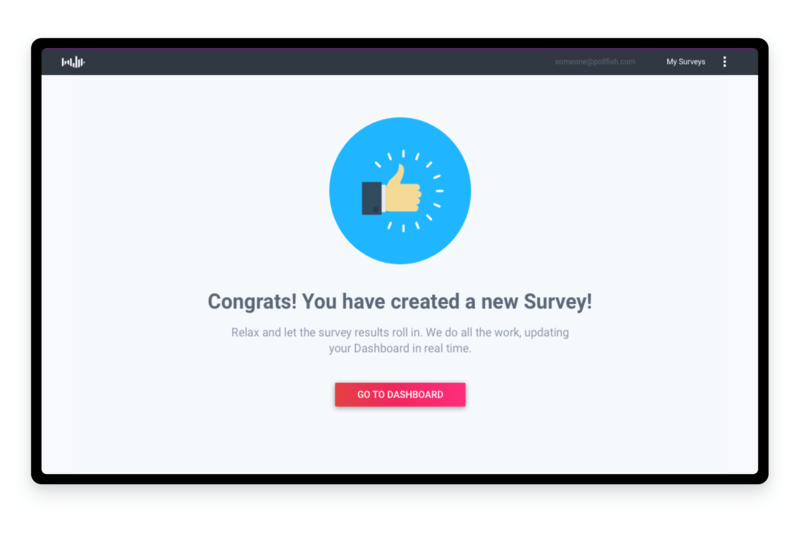 By directing newly signed up customers to a welcome page where they can create a new survey, then we will reduce the friction and increase the number of new customers buying a survey. By showing a success page after a customer buys a survey, then we will reassure them that their action has been processed and we will see an increase in people coming back for more surveys. As this was our first hypothesis, that customers are bouncing from that page and don't feel that they can trust the platform, we wanted to come with an idea of communicating our value proposition better and at the same time make the page feel trustworthy and fresh. Utilizing the split screen UI pattern, I was able to enhance the value proposition through a gallery of images combined with copy and keywords that resonate with customers and inspire trust by showcasing high profile clients. Also, using tabs I was able to expose the other persona of Pollfish, the Publisher. We had just finished building our style guide, figuring out patterns, our typography, colors and tone of voice and designing the sign-up page was our crash-test whether or not our style guide would be helpful and worth the ROI or a disaster. 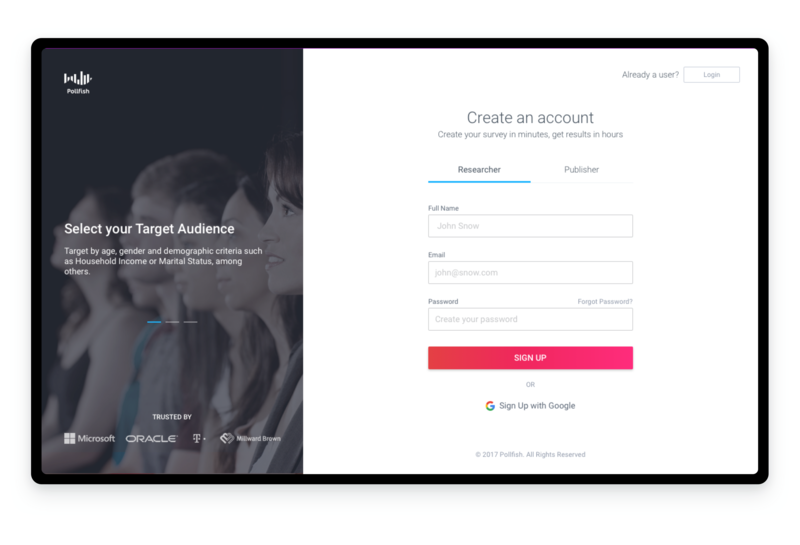 Displaying a welcoming message and exposing the primary job to be done, which is to create a survey, instead of directing newly signups to the dashboard where it was easy to get lost and added extra steps to the flow. 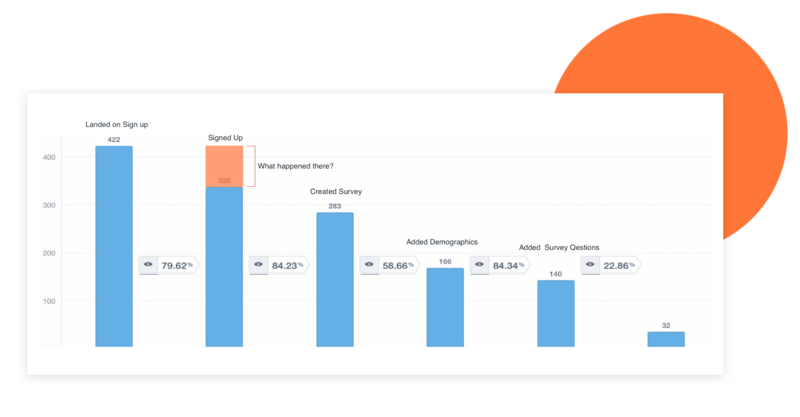 As this was our third and final hypothesis, that by showing a success page after a customer buys a survey, we will reassure them that their action has been processed and thus see an increase in people coming back for more surveys. By celebrating the moment when a customer has completed the most important task, to create a survey, and then buy it, we will be able to forge a positive emotional connection. Before progressing further in our on-boarding project we had to first evaluate our designs based on our hypotheses. We shipped our ideas and monitored the changes. The bounce rate from the sign-up page was reduced from 79% to 98% of users landing on that page and signing up. From the 98% of new users who signed up, 92% created a new project and 43% of that completed the journey to check out (buy a survey). We stopped getting support tickets from customers who paid for a survey that they don’t know what to do next. At that point, our data didn’t suggest that the Success Page was acting as a retention factor for our customers but rather helped them understand that their action has been processed from our end. Plan and implement an email strategy to educate and support Pollfish users. Tailor the on-boarding experience. Showing users a clear pathway to completion and establishing comfort with core features. Utilizing the power of in-app messaging with tools like Intercom or Zendesk.